← Zuma Fan Knows How To Beat The Weather! The 2000’s have seen a dynamic shift in the places where people work. Gone are the days of commuting at a standard time on regular days to a typical office. Today, work environments have evolved into a mobile workplace. The office desk has been replaced by airplanes, hotel rooms, the car, and even working from home. A new office environment is becoming prevalent – one typically inhabited by the “Road Warrior”. Smart companies today are reaching out to this new and growing market, catering to the mobile professional with office supplies online that offer unique office products to the business person on the go. When polled about challenges in the workplace, many workers say a big barrier to productivity is being unorganized. The reality is, it’s much more difficult to keep yourself together and organized on the road than in a sterile work environment that changes almost daily. This means new products for mobile professionals need to be designed to help organization, they must be flexible for changing needs, and portable for the professional on the go. Understanding the new market needs for mobile professionals Kensington, a strong brand in computer peripherals and cases, focuses resources and product development efforts towards this niche. A recent product introduction is ultra lightweight power adapters that let travelers charge their electronic items on a plane, as well as from a standard wall outlet. 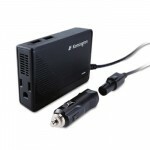 This adapter is specially developed to be extremely thin and compact so it fits easily inside a purse or brief case, and provides the power source business people need to stay connected. Today’s road warrior must stay connected, and we all have the tools to keep us linked in while on the road — the problem is keeping them charged and ready to go. That’s where the new Kensington Ultra-Thin Notebook Power Adapter comes in. This innovative power source charges all your electronic gadgets, from cell phones and PDA’s, to your laptop computer and iPod. The secret is a slim adapter that comes with the charger designed with multiple functions using a USB power port that’s part of the unit. A super cool feature is it works not only in your office, but also in the air using a planes power source. This Kensington adapter works on Planes, Trains and Automobiles! A mobile professional’s desk on the road is their brief case, and staying organized without becoming bogged down is no small feat. Contour computer cases by Kensington are uniquely made to keep you organized, while keeping the weight of your “traveling desk” from breaking your back. The key is an exclusive weight distribution system that uses proprietary technology to position the weight from your case to a users stronger muscle areas. This can reduce the strain, muscle fatigue and load by as much as 40%. Kensington cases are also designed with style in mind, and come in several different color and configuration choices. The road warrior of the 2000’s cannot take their file cabinet with them on the next 6 hour drive to meet a client. They don’t have the ability to take their desk with them on the road so they’re certain to have the right document when needed. The most well know company in file folders and supplies, Smead, understands the unique needs for today, and so they focus on portable filing solutions that maximize organization needs while being flexible and transportable. Let’s face it, organization in the office is hard…and on the road it’s a nightmare. Smead offers some very helpful hints to get you started in the right direction. First, find the right carry case, portable file chest, or rolling file cart that is large enough to carry at least a weeks amount of files. It’s crucial to find something with durable construction so it travels well, will not damage easily, and will not be open so contents can fall out if it’s tipped over. To organize your documents and file folders inside, start with Smead hanging folders and color coded tabs. Then find the right file jackets or folders to fit nicely inside the hanging folders. Smead recommends classification folders for their high capacity, the prongs provided to keep pages secure, and the multiple sections. Color coding is always a good idea, so you can quickly glance at your folders and know what color folder is the one you need. 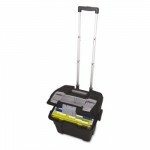 This Storex premium file cart is perfect to carry files on the road, and has a telescoping handle with wheels! Space limitations only allow me to mention Smead file folder products and Kensington computer accessories in this article. The truth is many other brands know the special needs of this market segment, and that it is growing rapidly. Companies like 3M, Avery, Cardinal, Esselte, Safco, Hon and Quartet. Where do I find these cool road warrior products for the mobile professional you ask. My advice is to never shop at the retail office “superstore”. They are huge corporations that care only about profits and the bottom line. I look for companies that help worthy charities and causes, and if I’m lucky find some, like Whole Foods Market in the grocery channel, that do good work by practicing a business model of conscious capitalism. There’s even a new company selling office supplies online today that donates 50% of profits to charity. Once you find a company you trust, support them with all your office needs – it’s well known that consolidating your suppliers saves big money. The right company will offer road warrior products and office supplies like report covers, view binders and Post-It notes, but also technology items for the office like privacy screens, shredders, laminators and digital memory. To further consolidate, look for janitorial supplies and break room items that every business needs. I am a mobile professional traveling all over, working from home, planes, buses, trains even sometimes an office. So I have a special affinity for fellow road warriors, and know how hard it is to stay productive, organized and “powered-up” on the road. Travel safely and in good spirits, try to find an office supply company that helps you do good work along the way, and and let’s all help others as best you can. This entry was posted in Cool & Interesting Stuff, Product Information and tagged Conscious Capialism, hanging folders, Hon, janitorial supplies, Kensington, mobile professionals, Office Supplies Online, Smead. Bookmark the permalink.